Stood at the bottom of these cliffs is a very intimidating place to be. It appears to overhang in every angle. Fortunately it is just an optical illusion and some cracking extremes breach this steep and complex cliff in a reasonable fashion. It’s southern orientation and concave topology means it can be a good venue on a cold and windy day, catching any sun going and sheltered even when it is blowing a hoolie in the cafe car-park. 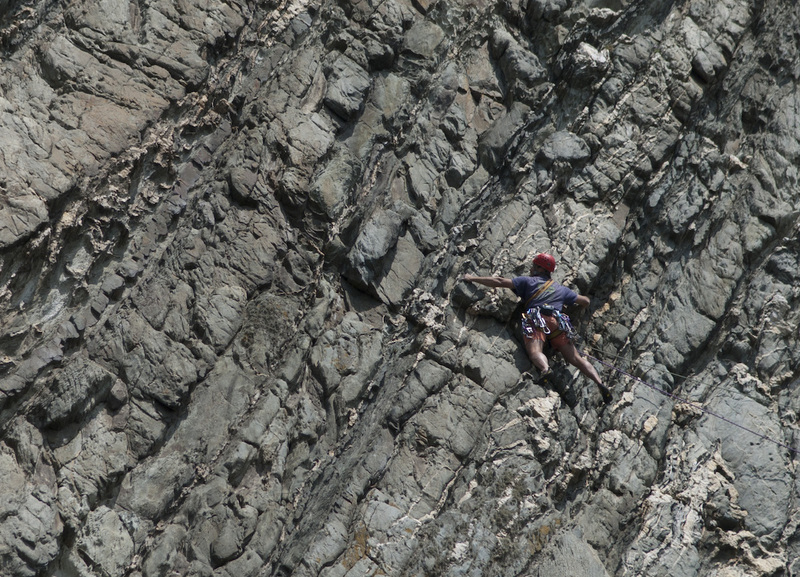 It is possible to approach by a long scramble and sea-level traverse but it is easier to abseil in near the line of The Savage to steep scrambly terrain. It may be advisable to leave the ab rope in-situ in case of failure. The routes are multi-pitch, often traversing and very, very steep so in case you end up dangling in space, you need to carry with you a means of ascending the rope e.g. ascenders, jumars, gri-gris, belay devices, slings, prusiks, shoe-laces, faith in god, brute strength or a combination of the above. A fine introduction to the peculiar delights of Yellow Wall. Protection is adequate but it can be tiresome to place in the hard sections. 1. 30m. 5a/b. From the end of the abseil, climb to the base of a corner capped by a diagonal roof. Climb this, then break out right under the overhang (with an increasing degree of difficulty / urgency) to pull up onto a slab. Move right to belay at the base of a groove (NB this single pitch combines the original first two…much more sensible). 2. 20m. 5b. Climb the groove for a couple of moves. Move left to a quartz crack (runners) carry on left for another 3 meters (very steep territory) to reach an obvious spike. Move up (feet on spike) to reach a resting position (thankfully). Traverse diagonally left to reach an an obvious break that runs back right to the top (dirty in places). It is also possible to take a direct finish up the slightly overhanging crack above the break. The Holliwell brothers, 1 June 1969. Well protected with excellent rock. 1. 30m 6b. Start below the groove of The Savage and take the undercut arete between that route and Perygl. The arete leads to a junction with Perygl under a roof, Perygl goes out right. Book of Ages goes goes straight over the roof above. Interesting moves reach the slab and belay above. 2. 20m 6a. Step left into the bottomless groove and climb it direct to the obvious crack above. Finish as for The Savage direct for the last few feet. Mike Twid Turner and Louise Turner, May 2007. A line I had climbed previously for its first pitch many years ago, now with an independent second pitch. A name reflecting the time taken for the next guide book to the area. Another excellent Yellow Wall excursion without too much danger. Start just to the right of The Savage, at a groove. 1. 18m. 4c. Shuffle up the groove, and belay beside an obvious wide crack. 2. 25m. 5c. Follow the crack around an arete to a bomb-bay groove. Difficult moves up and then back left under an overlap, lead onto a slab and belay. 3. 25m. 5b. Move up and into a groove, then cross the hanging slab to a stiff little wall. Climb diagonally right, and move around a steep arete, peg, to reach a steep groove, and finish up this. Joe Brown, Pete Crew (5 pts aid) 7 April 1969. 1 4c 15m. As for Pergyl p1. 2 6a 18m. Follow Pergyl around the arete then take the upper pocketed wall of The Drunk to a belay at the end of the roof beneath the groove of Creeping Lemma. 3 5c 18m. Take the steep diagonal crack in the right arete of Creeping Lemma’s top groove. Follow the continuation break beneath the small overlap to the top. Dave Garry and Neil Griffiths 2011. Rediscovered by Alex Mason and George Ullrich, May 2013. A good but unbalanced route, if it wasn’t for a fierce few moves on Pitch 2, it would be about E3. Start beneath a short corner on the left side of the wall. 1. 10m. 4c. As for The Moon. Climb the short corner and belay on a ledge/cave (occasional seagulls). 2. 20m. 6b. Follow the slanting cracks rightwards for 2m then attempt to break left throught the ‘line of weakness’ in the roof. Yes, that was the crux. Pleasantly stroll on up the slab above and a belay shared with Perygl. 3. 25m. 5b. As for Perygl pitch 3. Stevie Haston, John Tombs July 1986. Thoroughly deserving its classic status. According to first ascentionist Ed Drummond; The situations are strictly spacewalking.This may be the best trad climb in the world. It has exposure, commitment and uncertainty in abundance. Start beneath a short corner on the left side of the wall. 1. 10m 4c. A ‘harder than it looks’ pitch. Climb into the cave (occasional seagulls) to take a belay. 2. 30m 5c. The Pitch! Fabulous to lead, and tough to second…this is the essential Gogarth experience. Most people find enough reserves and determination to hang on. A great lead for the ‘thinking climber’…thugs may come unstuck! Break out right from the belay and continue traversing rightwards and upwards, always finding the easiest passage. A final tricky traverse right enables the belay to be clocked; an exposed blocky ledge in the middle of the wall and shared with most other routes acting as a central hub. 3. 30m 5b. An appropriate finale: great holds and biting exposure in a safe situation: savour this pitch. Best done in the teeth of a gathering storm. Intuitively follow the twin cracks in the rightwards rising rampline. Steeper and more awkward than it looks. Ed Drummond, Tony Barley, (4 pts aid) 17 July 1971. Second ascent Dave Ivory and John Hart, 1970s. Fourth ascent John Allen, Steve Bancroft (1 rest). Fifth and FFA Alec Sharp, Brian Hall ,1974. A meandering excursion through the yellow steepness culminating in one of the best E6 pitches around. 1. 15m. 4c. The Moon pitch 1. 2. 30m. 5c.Traverse right under The Moon along cramped ledges to join The Cow. Follow the (Judas) Cow to the Moon/Cow belay. 3. 10m. 5b/c. Step down from the belay and reverse Creeping Lemma pitch 2 rightwards towards ledges atop the promontory. Belay on the traverse before the apex of the promontory and below an amazing golden groove left of Dogs of War. 4. 43m. 6a. (Direct). A magnificent pitch which can also be gained from the promontory of The Sind/Creeping Lemma. Very pumpy funky climbing. The rock is softish in places but protection is adequate providing a large rack is carried. Climb directly up the golden groove to two peg runners. Steep and committing moves (crux) leads to a spike and rest on the left. Continue up the slab/groove and finish direct past a precarious block to the top. 4a. 43m 6a. (Original description). Climb up, easy but dangerous, to an overlap 6m left of Dogs of War. Move left and go round the overlap. Move up an insecure groove on flakes and small fins, to two very poor pegs on the right. Carry on, on sloping holds, until a long reach back right, on good rock, to an inverted groove. This leads gingerly over a block to the top. Stevie Haston, Ray Kay and Chris Dale, June 1986, pitch 2 climbed previously by Stevie Haston and Leigh McGinley 1981.Second ascent Craig Smith and Johnny Dawes 16/6/86. Direct Start to pitch 4 by Mike Twid Turner and Louise Thomas 1990s. Spectacular and well-protected. Mostly very reasonable for the grade apart from the flake-crack. Those with a traditional ‘thin hands’ jamming competency and finding dry conditions will romp up this too; it is more usual to thrash and dangle. Start as for The Moon, below a left to right diagonal overhanging flake-crack where it all gets steep. 1. 35m. 6a. Up trending rightwards to the overhanging crack. If you are lucky this will only be damp. Grapple with the crack (good training for Astroman…or vice versa?) into the easier continuation groove. Traverse right to an open corner and right again around the arête and go up to belay as for The Moon. 2. 30m. 5c. Launch straight over the overhang above the stance into a niche. Go over another roof into a groove leading to a slab and terra firma. Dave Pearce and Paul Trower, (2 points aid) 1976. FFA Pete Gomersall or Joe Healey 1980. Start as for The Cow. 2. 30m 6a. Climb the groove direct which Perygl top pitch traverses into. Climb straight up and move right to base of groove (bold), RP’s. Go up groove to top. Mike Twid Turner, Ian McNeill. 1992. Another Yellow Wall classic that finishes up the bottomless overhanging groove above the traverse of The Moon. 1. 20m. 5a. Follow the highest traverse line to belay below and right of a cave/overhang in the wall above, just over halfway to the promontory of The Sind/Creeping Lemma. Cams useful on the belay. 2. 25m. 6a. Gain the cave steeply from the right to reach a peg. On 18/7/9 this peg was noted to be extremely sh!t by now and unlikely to hold a fall. Good effort placing it in EBs in 1978 though! Exit leftwards and continue to reach the Moon/Cow belay. This pitch is E5 6a and often wet. 3. 30m. 6b. Reverse the second pitch of The Moon leftwards until underneath the groove. Ferocious moves entering the groove form the crux. If successful, you will not find it difficult to see where to go next. Protection once established in the groove is good, although the rock is fragile in places. Mick Fowler and Mike Morrison 7/8 April 1978 3 points aid. FFA Andy Pollit and Steve Andrews,10 May 1984. Second free ascent Stevie Haston 1980s. A line based on the arête between the top grooves of The Cow and Ludwig. Strenuous climbing on an awesome position, though escapable at times. 1. 20m 5a Ludwig p1. 2. 25m 5c. Climb up a sandy wall, to the right of Ludwig, to a ledge. Go up to an undercut flaky crack then strenuously pull up and slightly left to meet The Cow. Follow this to the belay. Mike Twid Turner, Pete Robins (AL) 20 May 2004. Cruises up the obvious diagonal line to finish up the hooded square cut groove between the top sections of Me and Isis is Angry. Strenuous and bold. 1. 10m 4c. The Moon p1. 2. 30m 5c. The Moon p2. 3. 35m 6b. Head out rightwards along the ramp, below the top pitch of The Moon, to join Me at the two pegs. Continue easily up this for 7 metres to a spike on the left. Grapple with fins out right to a ledge and continue to the base of the groove (cunning no hands head jam). Difficult moves, crux, with massive fall potential, lead into the groove. Follow this to the capping bulge, traverse right and move up to jugs. Grant Farquhar, Mike Turner, Andy Perkins 26 Sep 1993. Second Ascent James McHaffie and Nick Bullock, 2009 (see Welsh Connections DVD). Two serious pitches allow the purist to gain the promontory from the beach. From here the superb top pitch which is of comparable difficulty to Me lies between you and the Cafe. Alternatively the promontory can be gained by abseil and the main pitch climbed in it’s own right which will make more sense to most! 1. 28m 5c. This pitch famously “takes no prisoners”. It starts from the boulder beach below the horrific territory above. Cross a wet slab and then climb a short flake onto a ledge containing some grass cauliflowers. Climb the open scoop above trending rightwards utilising a four to one mixture of shale and cement to reach some flakes on an arete. Move up to large quartz holds then traverse back left and move down to belay on blocks. 2. 45m 5b. Move rightwards of the belay and up a short crack to gain the most obvious left to right traverse line. Follow this to the promontory and move up to it’s apex. 3. 39m 6b. Start 4 meters right of The Sind. Climb up to a niche, then pull round leftwards onto the The Sind’s golden slab. Climb this for a couple of meters before moving left to beneath a small roof, pull through this and follow a flake/crack to the large roof of Dog’s of War. Place some bomber runners then commit to the groove system straight above and follow it without respite to the top. Stevie Haston and Ray Kay over 2 consecutive weekends, July 1986. Originally climbed in 4 pitches with a hanging belay in The Sind. Top pitch repeated by Crispin Waddy 1980s. Entire route repeated by Mike Twid Turner and Owain Jones 1980s. James McHaffie on-sighting Isis is Angry. Photo Jack Geldard. Neither for the faint of heart, nor those with a ‘sport’ mentality, despite this being fine sport indeed! 1. 50m 4c. Easy, but all the more frightening for the lack of decent gear. A leftwards traverse across the grey wall into a groove, and then up. 2. 18m 5b.I know at least one E5 leader who couldn’t do this, but it really *is* only 5b! Easy climbing across the ledges to the narrowing at the corner. Cunning, rather than crimping, will pay dividends here. 3. 40m 5c. Now it gets hard! Continue with your leftwards progress, reversing the slab of The Moon, to make hard moves up and left through bulging rock to a groove and relief. Alec Sharp, Steve Humphries, Oct 1974. I nearly killed my belayer as I led the second pitch; be careful out there! Take plenty of slings. This is a very spooky experience. 1. 28m 5b. Traverse out right along the higher quartzy line of weakness, taking care with the ropes. Belay securely beneath a small roof. This protects you from inevitable and dangerous debris. 2. 43m 5c. Climb up and left to the base of a groove; the commitment begins here. The way ahead is obvious, but there are many hazards en route. Proceed with as much caution and lightness of step as you can muster. Once past the big roof and into the final groove, the horror eases. Malcolm Howells and Paul Trower, on-sight (1PA) May 1976. Second and FFA either by Dave Pearce and Pete Boardman (according to The Gogarth Saga) or Pete Boardman and Joe Tasker (according to the 1990 guide), 1976. This route takes a stunning diagonal line. Start from the steep ground below the crag gained by abseil. 1. 37m 5a. Follow the obvious lower diagonal break, taking the easiest line to gain the apex of the large promontory. 2. 37m 5b. The diagonal line continues up the obvious golden slab above the promontory. Gain the slab from the left and follow it with interest all the way to the top. Sustained sandiness with lots of runners in softish rock. Joe Brown, Pete Crew 28 Oct 1966. Second ascent Richard McHardy. Start as for Paddington on the ridge right of p2 of The Sind. Climb across a sandy wall to a sort of rest/ledge at the base of a groove. Climb up left (poor gear) and up in a parallel line to The Sind, aiming for an obvious nose of rock. Mike Twid Turner, Andy Barman June 1994. Worrying rock and doubtful protection, make this an unpopular route. It shares common ground with Pterodactyl, essentially consisting of a variation start and direct finish to the main groove of Pterodactyl. Start at the top of the ridge, just right of p2 of The Sind. 1. 40 feet. 5b. From the apex of the ridge traverse right, and climb the groove, with a horizontal traverse right to the base of the Pterodactyl groove. 2. 120 feet. 5a. Climb the Pterodactyl groove for 30 feet to the flake on the left wall where it curves right. Pull out left onto the wall. climb over an awkward bulge and trend right to finish. Mick Fowler, Mike Morrison 1 May 1978. A steep and strenuous route taking the prominent S-shaped groove to the right of The Sind. Allegedly equal to any other of the routes around the grade on the wall. The rock on the first pitch is sound and on the second pitch is no worse than The Sind. Scramble up the grass ramp in the middle of the wall to the foot of the groove. 1. 45 feet. 5b. Climb the rightward slanting break and exposed rib, crux, to reach manky pegs and a small exposed stance at the foot of the vertical groove. 2. 120 feet. 5a. Climb the groove until it bends to the right, forming a small roof, traverse right to a peg (possibly missing) placed vertically up under the roof, pull over the roof and so continue to the top. Geoff Cram and Mike Yates, 16 Oct 1966. This was the first route climbed on the Yellow Wall. Second ascent Richard McHardy. UKC Thread about this route. The 1977 guide states rather cryptically; “The wall immediately to the right of Pterodactyl has also been climbed”. An intricate climb which weaves its way up the wall, right of Pterodactyl. As runout as heaven is wide. Start 25 metres down the ramp from Pterodactyl at a block belay. 1 45m. 5c. Ascend up and right, following cracks, with gear, onto the edge of the wall. Go straight up past a small recess and through a bulge to a no-hands rest (hidden peg on a small ledge just above). Step back down and traverse left then go straight up until level with the Paddington/ Pterodactyl belay. (Possible to traverse left and place bad runners here – cam #4 useful). Now trend off up and right for a few miles to a small spike, crux. Go up and right again to a ledge and peg belay. 2 15m. 5c. From the stance, move up and right to a pair of Siamese pegs. Crank straight up the steep wall to finish in a groove. A bit spooky. Paul Pritchard, Ian Wilson, Debbie Quinn 15 July 96. A wandering and varied route up the very right arête of the Yellow Wall, Scary, technical and strenuous. 1 40m. 6b. Follow 93,000,000 Miles to the first peg. Step up and go right onto the flying arête, second peg and small wires. Make weird moves up and run it out in space to a ledge and peg belay, on 93,000,000 Miles. 2 20m. 6b. Move up and clip the pegs on 93,000,000 Miles and come back down. Make a hard traverse right under a roof and gain a huge flake (like a mirror image of Schittlegruber). Go up the flake to a horror niche, then right again to finish on the arête with much exposure. Paul Pritchard, Leigh McGinley (AL), Tom Leppert (17th & 18th of July, 1996 – one bivy in Llanberis). Second ascent Grant Farquhar and Alun Hughes, 1996. Grant Farquhar on Sign of the Sundog second ascent. Photo by Alun Hughes. Not Yellow Wall Escape Route HVS 80m. This route takes the right arête of the bay containing Yellow Wall and can be reached through the tunnel or by abseil. For those of you familiar with Red Wall Escape Route, this route offers a similar sort of experience on snappy rock with abundant vegetation thrown in. 1 33m. 4b. From the boulder beach, climb the arête and a small bulge to a bubble ledge. Move right and belay on a spike. 2 20m. 4a. Climb the groove behind the spike and move back left to the arête. Go up the grassy groove to belay. 3 27m. 4c. Climb the wall to a large spike. Step off this onto another wall and follow a rising rightwards traverse on Red Wall type rock to the top. Dave Ferguson, Bob Wightman 12 July 1997.